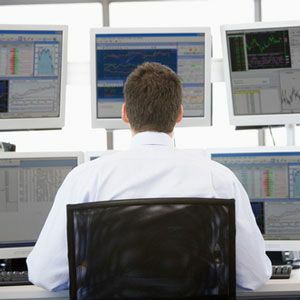 Productivity pros swear by multiple monitors, but we don’t all have the luxury of carrying around huge screens and endless wallets. On the other hand, the iPad has become pretty ubiquitous, and it can really help you be more productive 4 Ways To Use The iPad To Enhance The Use Of Your Personal Computer 4 Ways To Use The iPad To Enhance The Use Of Your Personal Computer Many people separate the personal computer and the iPad into two different worlds - the PC is for work and the iPad is for fun. But I think both devices don't have to be on... Read More . What if I told you there was a way you could use your iPad as a second monitor, extending your desktop with precious extra inches? That would be pretty amazing right? Well here are three iPad apps that let you do just that. 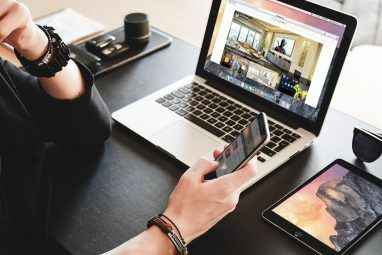 SplashTop is already the brand leader in high-performance remote control software for your PC or Mac via an iPad (you can even watch movies), so a second display app is a natural fit. In fact, the same Splashtop Streamer app is used on the PC/Mac side as the display driver. Once installed, you’re asked to create a username and password, but these are only needed for the remote control Splashtop 2 app. However, you will need to click on the Security tab and create a security code, which isn’t obvious; as well as install the virtual display driver under Settings > Advanced. A restart is also required. When youre finished with all that, switch over to the iPad, launch XDisplay and you should see that your computer has been automatically discovered. Tap on it and it should connect, though it took a few refreshes for me and looked like the computer was breaking in the process. Eventually though, the screen will be extended and a helpful hint system displayed. A three-finger tap will open the app settings, one of which is to switch between smooth and sharp. In smooth mode, video playback was great, but text is fuzzy. In sharp mode, video was still playable, but mouse response took a nosedive. Most text was easy to read, but clearly not “retina” grade. It’s also worth noting that touch controls mouse movement, so you should be able to draw into desktop applications with this app if you wanted. And because the app is resolution independent, you can also zoom in. Splashtop XDisplay is free to download with a 10 minute limitation, and is currently on 50% sale at $4.99 to unlock the full app. 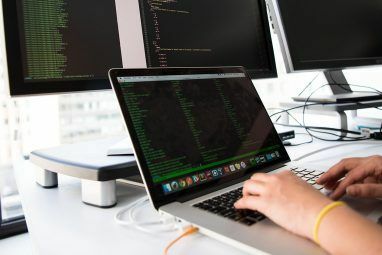 It’s a pain to setup and the required steps aren’t obvious or documented in any central place, but it does work exactly as it says on the tin, and being able to switch between sharp text or smoother graphics makes it suitable for a wide range of applications. $9.99 might seem like a high price to pay for an app which is rated 2 stars average and only Mac compatible, but I had no specific issues using this, so can only assume the ratings came form previous buggy versions. Install the connector software and restart – that’s it. No passwords, no hidden driver installs. It just works. The interface on MiniDisplay for the iPad is simple, with a nice image of any recognized machines. Select the machine, and a few seconds later you have an extended desktop. If your Mac has a user password set, you’ll need to enter that. The lag is unbearably slow – it would take a few seconds or so to drag a window onto the extended desktop and have it appear. Just writing text into an email or Evernote is acceptable. The text however, is crystal clear – it’s obviously using the native retina resolution of the iPad, which explains the lag. Video playback is impossible, but if writing emails or reading small chat displays is your main use case, you might appreciate the retina graphics. Mouse movement is performed using a single tap, so no drawing is possible. 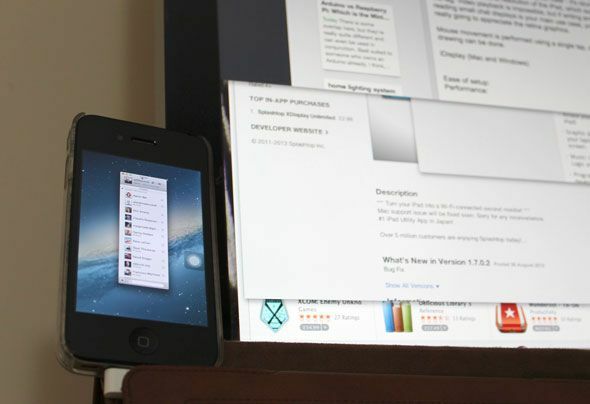 Mini Display is a universal app, so you can also run it on your iPhone – though only one device can be connected at the same time which means no lining up every iDevice you own for fun. It’s also worth pointing out that the higher resolution of the iPhone makes it completely unusable for, well, anything. Again, a single install and no passwords to set or additional steps required. If there was any confusion about what to do, launching Air Display on the iPad explains exactly what you need to do for either Mac or Windows, including how to setup an ad-hoc Wi-Fi network if needed. To actually start using the display, activate and select the second device from the menu bar in the Mac or Windows AirDisplay host. Note: there used to be a free version of this app that has since been withdrawn – the developers found it was butchering sales of the full app. Again, Air Display uses the full resolution of an iPad – which is approximately the same as my iMac, so the pixel density renders a lot of apps unusable, though with incredibly clear detail. Here’s some tiny Photoshop menus, for example. Video and general usage is very laggy, though subjectively didn’t feel as bad as Mini-Display. You can even draw directly into Photoshop, smoothly but albeit with a noticeable second delay between touching and having the line appear. Significantly, AirDisplay also includes the option to not use retina resolutions – it’s tucked away in the preferences. Disabling this puts it on par with XDisplay’s sharp setting, and makes everything more responsive and UI elements more reasonably sized. To be honest, trying to use the iPad as a second screen just made me squint an awful lot no matter what the app. Then again, my main work machine is a 27″ iMac – if you were to place the iPad alongside a 13″ MacBook Air, you might be more appreciative of any extra inches you could get your hands on. For basic tasks like keeping a chat window open, checking a mail client or perhaps as a status monitor – the iPad works admirably. The clear winner for me in this round-up though has to Splashtop XDisplay. Yes, it doesn’t display at retina resolution, but in practice this is actually better than the other apps which ended up displaying windows at incredible detail, but so tiny as to be useless. XDisplay lets you switch between a higher quality (though not retina) resolution, and something more than acceptable for smooth video playback. It’s sadly let down by the complex and somewhat daunting install process. AirDisplay comes an admirable second once you disable retina graphics, and the setup is far friendlier. It’s a tough call between the two. Have you found a better solution to use your use iPad as a second monitor? Let us know in the comments if you have, or if you use your iPad as a second monitor often – we’d love to hear your experiences and what kind of apps you dock there. I have been playing with different apps but the best solution I have found was spacedesk. The most convenient was that you do not net set anything up on an additional device. App is installed on hosting computer. On any phone or tablet (not not only apple devices) just open browser and to the app site. then enter local ip of hosting machine and it will connect. I have discovered that if your clicking on that additional screen, there is a short delay, but when the mouse is not on that screen, for example just a movie, there is no delay. 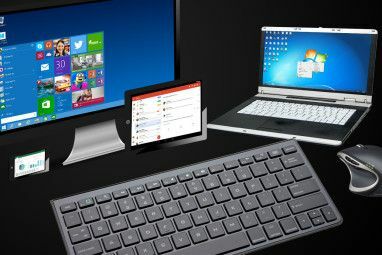 The only thing that is really missing is that you can use touchscreen of the connected device to control hosting PC. For example this feature would be helpful for any flight sim games, where it could be used to change setting on planes pannel. But that is still good enough for free app. I have described some experience in the article below. Has anyone used the iPad 4, not only as a secondary monitor, but as a Cintiq with Photoshop or Illustrator? I'm thinking of pairing the iPad 4 with the new 11" Macbook Air to save money compared to the upcoming Wacom Cintiq Companion. Refurbished iPad 4 + Cellular at $529 and the new Air at $1200 equals $1729 VS Wacom's entry price of $1999. I think the Apple OS and iOS is way more user friendly than Windows 8, but with Wacom, I'm considering giving Windows 8 a chance. However, the option to save a headache and $200 is quite persuasive. In theory this sounds like a decent plan. The major difference is that the Windows and Android Tablets are running a much more substantial OS with larger CPUs and more RAM. The new Wacom Companion series is a bit too overpriced if you ask me but is actually geared towards a professional workflow. If you buy a new ipad and the new wacom ipad pen ($100 usd) you'll get some of the same pressure sensitivity but not as robust as with the tablet. IMO it's a patch and not a solution geared more towards the hobbyist/Am Pro/ Illustrator and Digital Artist. "I know kexts (key extension?) are core system files, and messing around with them incorrectly is one of the few things you can do to break a Mac." A kext is a Kernel Extension. Basically, this is a driver. Nothing to worry about. Well, I've broken quite a few hackintoshes by messing around with them. Sure, but that's no different from any computer system ever. If you go messing around in c:\Windows\system32 (or whatever it is) on a windows box, you can easily break things too. I just downloaded display pad today and really like it. It requires a free client on the mac/windows side and I think it was $3 for the ipad app. While there was some slight lag it worked quite smoothly and with very easy setup. In fact once the client is running you just choose your setup in display preferences like any external monitor.